When selecting a chimney pot that will function properly it is important to consider the top opening in relation to the fireplace opening, and the base dimensions in relation to the flue they are covering. The top opening should be in ratio to the fireplace opening. The chimney pot opening is often smaller than the effective area of the flue liner in order to reduce the effect of wind on the draft. Flue area is typically about 1/10 the fireplace opening area for square flues and about 1/12 for round flues. For chimney pots this ratio is often reduced to 1/15 - 1/20. 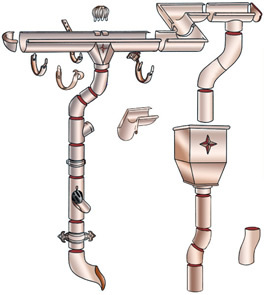 The base inside dimension and the base outside dimension should be nearly as large or larger than the largest dimension of the flue they are being installed on. The base of the chimney pot should not impinge on the effective area of the flue by more than 3/4 of an inch. Many other factors such as fireplace chimney construction and house air pressure can affect proper chimney operation. Chimney pots are set in a bed of mortar on the masonry chimney cap. The base of the chimney pot need not match the dimensions of the flue liner it is being installed on top of, but should not impinge on the inside area of the flue liner except for the maximum 3/4 of an inch in the corners. The flue liner may extend up inside the chimney pot, or the flue liner may be flush with the top surface of the chimney cap. Additional anchoring may be used to prevent damage from tornadoes, hurricanes or earthquakes. A 1/4 - 1/2 inch diameter hole may be drilled in at least two opposite sides of the chimney pot and a bar used to anchor the top into the grout or the chimney walls. When installing on wood chase chimneys, special attention should be given to preventing water leakage around the base of the chimney pot. Want a chimney pot in a different color? Not a problem. Any of our pots can be ordered in any of seven standard glazes. In addition to natural terra cotta, choose from black, buff, blue limestone, gray limestone, sandstone, brick red or salt glaze (brown). And if none of these suit your fancy, we can develop custom glazes and finishes to meet your needs.